Ann Arbor might be a poor gage of Michigan’s voting patterns, being an island of blue in a gerrymandered red-ish state (state government is all Republican, senators and presidential votes are generally blue), but I have yet to see a Clinton bumper sticker. What I have seen is Sanders bumper stickers popping up. More every week. Watching the national news last night, they’re trying to pin Clinton’s eroding support on her email “scandal.” Truth is more people are recognizing that the only difference between her and any of the Republicans is abortion. What I have seen is Sanders bumper stickers popping up. More every week. Yeah, I’m working with others to get more of those out there for free just sitting in piles at coffee shops, etc. so it’s a no-brainer to grab one and stick it on your car, laptop, etc. – I think the added visibility will really help Sanders – as the more people tend to hear about him, the more they want to learn about him and the more they tend to support him after doing so. [/quote]Agreed, I think that’s only eroding her already weak support within red states. People sitting on the fence between her and Sanders aren’t going to pay it much attention unless it gets more legs, I figure. And, the Hillary faithful are probably going to chock it up to a partisan witch-hunt even if the email scandal does become more problematic for her. Frankly, the more revelations there are about it, the more I question her judgement in regards to secrecy, etc. and even some of her own supporters are actually starting to get concerned about her decision-making with how she’s handling the backlash. It’s definitely no good for her, but I agree with you that it’s currently not an issue that’s going to make or break it for her with Sanders unless it goes wildly out of control for her in the future. Truth is more people are recognizing that the only difference between her and any of the Republicans is abortion. [/quote]That and her perpetual pandering is certainly hurting her untrustworthiness factor. It was a huge component to her loss against Obama with a somewhat complicit corporate media at his side for the latter half of his monied campaign. Fortunately for Sanders, even as most of the corporate media is hostile towards him, some of the Republican protectionist media will cover her transgressions nonetheless. The rest of it is up to his huge grassroots base to spread the truth about Hillary Clinton to her supporters. Political pundits are like fad diets, an industry that somehow succeeds by being wrong. I honestly can’t imagine that people care about the email scandal. That’s the kind of thing that only raises concerns if you don’t trust the person to begin with. If that scandal has legs it shows that people didn’t really trust her and that her eroding support was already set to erode. Clinton surely has a large number of excited advocates and followers, but I think for most people she’s a default candidate - someone who would inevitably win so there was no point in worrying about it. Clinton’s eroding support is obviously due to people being excited about Sanders, but I also think it probably has a lot to do with people just being happy it’s not a coronation of a candidate that they were never really that into to begin with. C4’s are allowed to do such things after citizens United C3’s are not. Also, the Red Cross was run by a number of republicans in the past. 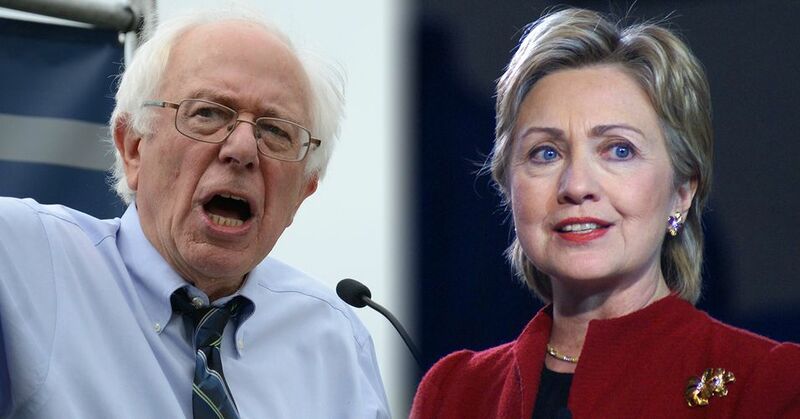 it seems unlikely they would endorse Bernie sanders even if they could. Or, it could very well get legs due to the fact she made mistakes in judgement. Time will tell. However, in the meantime, I certainly wouldn’t count on the email scandal doing her much damage anywhere except in red states where she’s already fairly weak. That could very well work in Sanders’ favor to some extent in a tight race, but Sanders nor his supporters should make more of this email scandal than it currently is – or we’ll risk losing credibility ourselves if and when she’s vindicated and/or the corporate media decides to move along after being well-greased enough with her TV campaign ad money. Either way, we should just let her and the Republican pot-stirrers fight it out and let the chips fall where they may. In the end, they both may end up looking badly while Sanders just stays out of it and benefits from both sides getting locked into untrustworthy, partisan bickering that many Americans are sick of already. Let’s also keep in mind that these polls results are skewed against Sanders due to the preponderance of cell phone users within his demographic. Oh, does this mean we have to suffer an October Surprise this year and next? I think it shows that in about a month from now, Sanders may very well either equal or surpass Hillary Clinton in national polls. There’s no reason to believe that Sanders is suddenly going to stop surging after consistently climbing up until literally 4 days ago. The more his name recognition has been increasing, the more he surges. 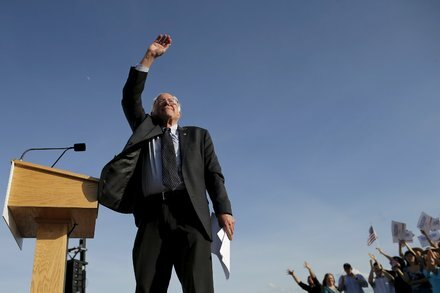 The corporate media can’t hide Bernie Sanders forever. It shows that Bernie Sanders can win. Allow me to re-state my question as the snark it is. I won’t be surprised when some establishment democratic party agents pull some dirty trick as Bernie closes in on taking the lead. Which, by your projections, will be October. I want this to be true. I really do. I’m sending all my hope and positive thoughts from across this side of the Atlantic. And if I meet any Americans here, who happen to be registered Democrats, I’ll certainly canvass them in Bernie’s support. But I would urge a moment of caution. Extrapolating promising trends can be misleading, and the “skewed polls” meme is one from mitt Romney’s campaign, and we all know how that ended. It’s possible. But polls don’t shift on their own. I’ve updated the chart to reinforce how short-term it is and added a disclaimer to hopefully alleviate any confusion it may cause. It’ll be fun to see how close or far off it is. Which, by your projections, will be October. Actually, if the pace of Sanders’ rise maintains and Hillary’s decent continues at about the same rate, it could be as soon as September that Bernie Sanders ties or surpasses Hillary Clinton. Just for fun, I’ll predict it’ll happen around Sept 27th. I won’t be editing this post so we can see how close or far off I will be. Ignoring the only real candidate because they are too busy screwing around with the first two. Nice graph. Can you pin the crossover to Halloween and add in a scary pumpkin with Bernie hair graphic to drive the point home? Ok Nate, I’m with you on that calculation. ETA: Damn I can’t wait to listen to this, though. Me too. It’ll be fun. Here’s a little dubious street cred. I met Bernie in 2000 and shook his hand. I was at a Ralph Nader event, just as Nader was getting started. Shook Nader’s hand too and said hi. The event was at the high school in Montpelier. News reports back in the day pegged it at 400 people attending. It was more like 200. Bernie introduced Ralph, and what was awesome was Bernie went into a total RED MEAT TIRADE. His hair got all mussed up and was standing out on end; he had broken a sweat and his cheeks were rosy. He really worked up that small Vermont crowd. Then Nader spoke, not nearly as entertaining as Bernie, but still good. Remember this all happened well before Hanging Chads and the Democratic Implosion and Republican Hostile Takeover of 2000. Also saw Bernie a few times at the Tunbridge Fair over the years, but I’d already met him and didn’t have anything new to talk about so I just observed from a distance. He was just the state rep, and then, hey, now he’s a Senator, cool! I never thought at the time that I’d see him running for Prez. All the times I saw him on Bill Maher and around, through the years, meeting up with him again in a group at the statehouse when I was a selectman, etc. Never thought for a minute he would make a run… OR… that he’d be so damn successful at it. Anyways, that’s my Bernie story. Ok what other infographics need to be made? We need a compilation website with all the pertinent graphics in one place. For instance, Hillary as Senator vs Bernie’s voting record during the same time period. Other ideas? Start thinking & suggesting and I am willing to lead the creation. The two disagreed rarely, but those differences were on some of the biggest issues of the day. That is useful. I need a dollar value on each of the 31, defining the difference. I also need to know the rest of the 93% and dollar values on those. Any suggestions?